Samsung has been caught cheating on benchmarks before by overclocking its processor and now finally someone is doing something about them. 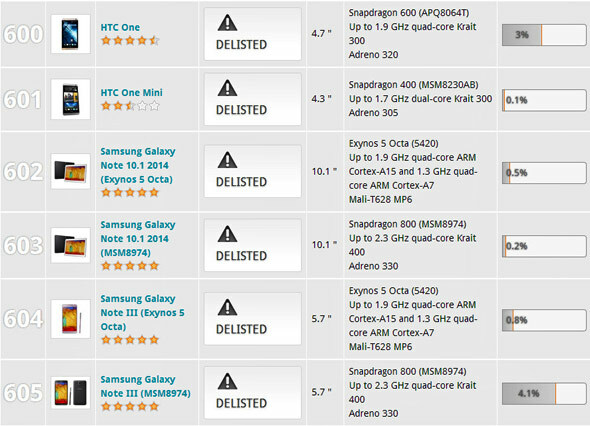 Futuremark, well-known for its benchmarking prowess is delisting Samsung handsets that overclock when certain apps are run. There is some room for debate about the validity of allowing clocked processors to be benchmarked. After all what’s wrong with finding out just how far a cpu can be pushed like those intel and Amd chips. As a technical exercise there is no issue with it yet those performance figures don’t translate into real world usage. No matter if you think it’s fine to overclock for a test or not, all handsets have to adhere to the rules as set out; Futuremark said in statement. Samsung and HTC headsets detect the name of the executable and overclock so. The simple act of renaming that very same executable yields different results. There are reasons for cpu’s being clocked namely battery life and thermals. There’s a difficult balance to be struck between all out power and keeping some battery life.